Cable trunking is used to protect cables from possible damage and to hide unsightly cables. Trunking can provide easy access to the cable when needed via removable modular covers. It can be used in almost any location including offices, hotels and hospitals. Electrical trunking is available in many materials, sizes and forms to suit the requirements of the installation. Our electrical cable trunking is the perfect cable management solution. With any new build or renovation project, cable management is an essential consideration. We offer cable trunking in a range of materials so we are bound to have the product you require. When electrical cables need to be run underground then our trunking solutions are ideal. 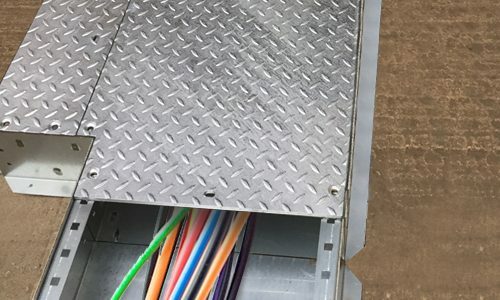 They can provide cable trunking within screed and protect electrical wires and cables from getting damaged either within the building process or for years to come offering optimal cable management. Our HD and SFD systems feature patented side flanges to secure trays when the screed is floated into position. We use a range of trunking accessories to allow the jointing and cornering of runs of duct to the required configuration. Our electrical trunking keeps your environment free from cabling by encasing the tidy wires. Our trunking can also be used for pipe trunking and service ducting.